This blog is not about adding a new recipe to your already impressive repertoire. It’s for people who don’t really have a repertoire. It’s all about being flexible, creative – and having a go. Recipes are useful, obviously, but just a guideline if you’re too much of a cowboy to slavishly follow them. And anyway, you don’t have the ingredients at your disposal that real chefs seem to assume everyone does. The aim of this blog is to teach the unskilled and inexperienced to make something out of what they’ve got in the house – or just fly into the supermarket and pick a few things up. You don’t want to be in the kitchen for hours and nor do I. Grab a few ingredients, mix them together and be eating in half an hour or so – that’s what I’m talking about. Radio on in the background, glass of wine on the go, and a decent result at the end of it. In Venezuela they eat black beans with arepas, the corn flatbread they eat all the time. But they go just as well with ordinary homemade flatbread or plain old toast – just make sure it’s decent bread. The fluffy, slightly sweet stuff that sells by the truckload in many parts of the world is an insult to the tastebuds and even if you’re used to it, just get unused to it. Find something with a bit of body to it, a bit of earthy oomph, a bit of natural wheaty flavor. Presumably many people like that bland, mass-produced stuff, but you don’t have to follow the crowd. 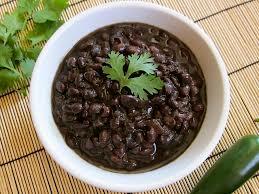 Now, savoury black beans – and this could hardly be simpler. In fact the most difficult thing might be finding them, depending on what country you’re in and if you’re in an area without a decent supermarket or healthfood store. But they might be there, hidden among the cans of baked, kidney, brown, haricots and all the rest, but you’ve never noticed because you’ve never wanted them before. You may also find them in their dried form, which will mean soaking and boiling them before you start. But a can of black beans is just as good. Like so many tasty dishes, this is cheap and dead easy. It’s food for getting the job done, the job being to get some nourishment into yourself and your family with minimal fuss and expense. 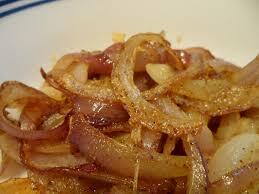 A medium onion, halved and sliced. Cilantro (coriander leaves), half a handful, roughly chopped or torn. Some people tell me they don’t like cilantro, which is up to them, even if I find it hard to believe. If you are one of those people, or you just can’t find any of the fresh plant (dried is not the same at all), use flat leaf parsley. In some countries, notably the Caribbean, they have culantro, which is different by one vowel and similarly close in flavor. In Trinidad and Tobago they call it Shadow Benny (officially chadon beni). It has long narrow leaves and when you chop it and use it in a cooked recipe, it’s hard to tell the difference (it’s not so good raw, though). Make your arepas, flatbreads (see my recipes on this site) or toast. While they’re cooking, heat a frying pan and add a little oil. Fry the onion until it is just turning brown. Mix in the cilantro, plus a little salt and black pepper, plus a touch of general seasoning (which is mainly salt plus a touch of herb and spice). A sprinkle of cayenne can help, if you like a bit of zip. When the mixture is hot, serve with the bread. Ludicrously easy, tasty, nutritious – and exotic.